Email – it’s convenient, free and easy. Today, it is the most rapidly growing means of communication. This is a basic introduction to email and we use a conversational non-technical style to explain how to use it. We chose Google’s Gmail email as the email to demonstrate for this class since it’s easy to use and integrates into other programs that we recommend. Email is an electronic way to send or retrieve personal and/or business-related messages, including text and pictures. No postage stamps are required! Think of email like the postal service. To receive email, you must have an account on a mail server. This is similar to your mailing address where you receive letters. We will be using the Gmail mail server. Your email message is sent from your computer to a server (it’s like the post office) where the computer looks at the address (like the address on a letter) and then directs the message on to the server associated with the recipient’s email account. Once your email arrives at its destination mail server, the message is stored in an electronic mailbox (like your regular mail box) until the recipient retrieves it. You can still receive email while your computer is turned off. The mail server collects and stores your incoming email until the next time you access your email by opening your mailbox and downloading your messages. You can send email to anyone in the world, as long as you have his or her email address. The user name comes before the “@” sign. When you sign up for an email account, you’re usually asked to supply a user name (your first initial and last name is often used). The domain name comes after the “@” sign. This refers to the mail server, the computer that stores your electronic mailbox. It’s usually the name of a company or organization. On the Internet, everything moves at the speed of light, including email. Because email can be sent and received so quickly, it’s often written in a more conversational manner than a formal letter. An email with grammatical errors can be viewed as being “sloppy” and so you should ensure that your email is written in a manner that will be deemed appropriate by the person that reads it. Always double check your email before clicking the send button: use proper grammar, capitalize your I’s, and don’t use an inappropriate or angry tone. While the tone of most emails are casual, it’s important that emails to ensure your email doesn’t reflect poorly on you by the person that reads it. We choose to teach you how to use Gmail because it is free and rich in features. It has a clean, easy to use interface, and integrates with other applications Net Literacy recommends. Gmail is provided by Google at no cost to users primarily because Google includes relatively small and non-intrusive advertisements. On the top right corner of the screen where it says “New to Gmail?”- click on the red “Create an account” button. Begin by typing in your personal information. This information will only be shared with Google, a reputable company that promises to keep your personal information safe and secure. Type in your First Name and Last Name in their respective boxes. Type in your preferred username – which will be your unique email address. Some addresses have already be taken, so click on the Check Availability button to determine if the email address that you have entered is available. If you get an error message, simply enter an alternative email address and continue to try different email addresses until you choose on that you like and see that it is available by clicking on the “Check Availability” button. Type in a password and write it down in a safe place. This password must have at least 8 letters or numbers in it. Read the Safe Connects section of the Net Literacy site to learn how to create a good password. Retype your password in the next box and Google will double check it for accuracy. If you are on your home computer and you are the only one that uses the computer, you can choose to have your computer automatically log you into Gmail (more on this later). If you are at a public computer, such as at a library, deselect the first checkbox under the second password box because you don’t want other people to have access to your Gmail account. The next checkbox allows you to have a more accurate search experience with Google’s search engine based upon your past search history. Clicking the next checkbox will cause Google to remember your search history when a Google search is performed in the future. Check this if you desire this functionality. Select a secret question that would be difficult for others to guess. If you forget your password but know the answer to your secret question, you can enter the answer to the secret question and gain access to your account. If this ever happens, consider asking a friend or family member to help if you have difficulty resolving the problem. If you have another email address, feel free to enter it in. If you forget your password, an email will be sent to this address confirming that you really want to change your Gmail password. If you have a family member who is helping you setup your account and you want to use their email account if you can’t access your e-mail account, you can input their email address in the “Recovery email” blank. Type in the Letters/Numbers that you see in the picture. This is to prevent computers from automatically registering new Gmail accounts. You do not need to write the numbers/letters down. If you can’t read the words, press the “refresh circle” or ask for help. The words might not be real words, but just a string of letters. Click the “I accept, create my account” button. 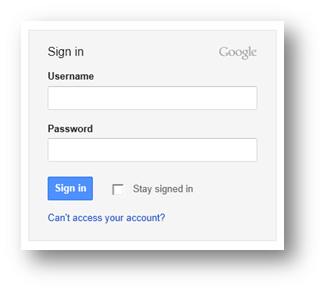 Now you must verify your account because Google wants to ensure your Gmail account is secure and accessible only by you. If you do not have a phone capable of receiving text messages, select the option for the service to call you. Next, input the verification code that came to your phone. Afterwards, press verify. Please be aware that it might take up to 15 minutes for the service to contact you. And now you’re set up! Click on the “Show me my account” button. Congratulations! You now have a Gmail email account! Type: www.Gmail.com into the address box of the browser. If your inbox does not load, type your Gmail E-mail address in the “username” box. As soon as you log in, you will be directed to you inbox, where new mail arrives! Type the recipient’s email address in the “To:” box. Ensure that you correctly enter the email address or the message will be sent either to a different person or returned back to you with a note that it was undeliverable – just like the postal service! Use your mouse and click inside the message box (the large box under “Plain Text” in the picture below – it’s where you will write your email letter) and move the cursor to that space. Type the body of your message. How long does it take for a message to be delivered? It may only take a few seconds for an email to be delivered. The computer sends a message through your modem (device your computer uses to access the Internet), then the email message is sent to your mail server which sends it to the recipient’s mail server, then the recipient’s computer receives it when s/he opens her or his mailbox. However, it occasionally takes longer than a few seconds if you are sending an email message with a large attachment, there’s congestion on the Internet, or Gmail’s servers are being heavily used. To read an email, click on the subject of the email. Open the message that you are replying to. Click the “Reply” button, which looks like an arrow pointing to the left. The program will present you with a message already addressed to the sender. The subject line will state “Re:” and then the old message’s subject. You will probably not change the subject line so the receiver knows that you are replying to a previously an email that was previously sent. Click in the box above the text to which you are replying. Click “Send” when you are finished typing your message and are ready to send it. 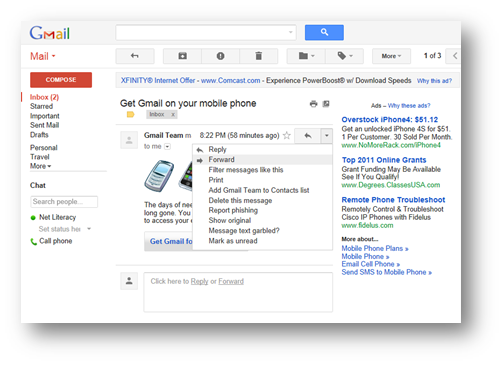 Gmail is free because Google supports this service with ads displayed in the Gmail windows. It’s important to note where the advertisements are located, so as not to confuse them with the email content. Open the message you wish to forward to another person. Click the down arrow next to the reply arrow. Type the recipient’s address(es) in the “To:” box. Type a note above the forwarded message (optional). In earlier email programs, the amount of space available for emails was very limited – users had to carefully mange the amount of email that had and delete emails that had read. Nowadays space is not really a problem. Gmail allows you to save virtually every email that you receive (and makes your messages searchable). To clean up your inbox, select old emails using the boxes to the left of the messages in your inbox and then click “archive.” They will no longer show up in your inbox, but will be available when you conduct a search. One of the most popular features of Gmail is the ability to search for specific emails among all the emails that you have received (assuming that they are either in your inbox or that you have archived them). To search for an email, type in your search terms in the top search bar – these might include the subject of the email, words in the narrative of the email, or the email address of the sender (this is very similar to searching the Internet with the Google search engine)! Click “Search email” and the results will be displayed. Email is not completely private since it sent over the Internet. You might consider email as private as a postcard. A good rule to follow is to not send anything that you wouldn’t want everyone to see. For example, it’s a bad idea to email your credit card number, checking account number, or your social security number in an email message. It is possible for messages to be intercepted by those who shouldn’t be reading them, especially in a work environment. While the chances of someone reading your email messages are slim, be aware that it is a possibility. For more information about Email safety, visit the Safe Connects section on the Net Literacy website. And remember that once you’ve sent an email message, you can’t get it back. Think before you click send, because it’s on its way for good! Spam is the Internet equivalent to “junk mail.” Advertisers send emails that are deceptive or fake and that may be an effort to steal your credit card number. If you receive an email from a company or person that you don’t know, it might be spam. Spam is sent to millions of email addresses and it is important to be aware of it. It best to consider spam as being malicious – so never reply to it – even if it has an unsubscribe link. People think that unsubscribing removes you from the advertising list, but some spammers use this to confirm that your email address is active and it could result in more spam being sent to you. Gmail already has very powerful spam protection, and all suspected spam is sent to the “spam” folder on the left of the Gmail screen. If there is mail from someone you don’t know, and the subject line is questionable, don’t open it. It may be spam or contain viruses. Be careful about the websites that you ask you to enter your email address. Visit the Safe Connects section on the Net Literacy website to learn more about how to minimize the amount of spam that you receive. Never buy anything offered by a spammer. Attachment – a text file or image, such as a photograph, sent as part of an email message (will be covered in advanced class). Bcc – a “blind” carbon copy, a feature where if you “bcc” someone, the original receiver of the message will not know that a copy of the message will be received by the individual who is “bcc”-ed. Bouncing – when a message is not delivered because of an incorrect address, misspelling, etc. and is returned to you via your email system. Sometimes there is a delay when receiving notification of bounced mail. Sometimes, the system will try for several hours before giving up and notifying you that the email has been bounced. Email Acronyms – Some acronyms you may see in your E-mails. Emoticons – Also referred to as smileys, these symbols help convey the tone, or emotion of an online message. Folders – (Inbox, Draft, Sent, Trash, etc.) can be used to organize your messages (will be covered in advanced class). “Forwarding” a Message – Sending a message on to another person. Header – the section of an email message that includes To, From, Subject, Cc, and attached fields. Inbox – the location where incoming mail is stored in your email account. Internet – A network of computers that carries data and makes the exchange of information possible. Allows access to the World Wide Web and email functions. ISP– Internet Service Provider – the company that provides you access to the Internet (like a gateway between you and the Internet). E.g., Comcast, AT&T, Verizon, or Time Warner. Almost all ISPs offer a proprietary email address with every account. Using Gmail allows you to keep your email address when you switch Internet Service Providers. Mail server – a computer in a network that acts as a post office, sorting incoming mail and forwarding outgoing mail. Netiquette – Internet Etiquette. Acceptable practices of using various Internet resources. Example: DON’T USE ALL CAPS. IT APPEARS AS IF THE WRITER IS SHOUTING. Online service – a company that maintains an exclusive network and provides subscribers with services like email and chat rooms – like Google. POP/POP3 – Post Office Protocol – A mail protocol that is used by an application on a user’s computer such as Outlook Express as opposed to a web application such as Gmail or Hotmail. Email is held until the user accesses their account, at which time the mail is transferred to the user’s computer. Web-Based email – when email is not downloaded to an application on a user’s computer but is rather viewed online via a web browser such as Chrome or Internet Explorer. Examples of web-based email providers are Gmail, Yahoo, and Hotmail (also known as Windows Live Mail). Spam – to send unsolicited commercial email, usually in large amounts and indiscriminately, to discussion groups or lists of email addresses. WWW – World Wide Web – a subset of the Internet. A collection of inter-linked documents. Remember, the Internet can exist without the web, but the web can’t exist without the Internet.